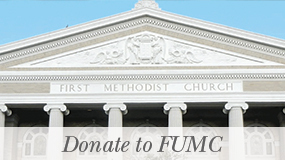 Pastor Michael Mumme joined the First UMC team in July 2015. 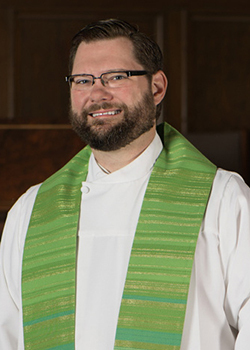 He is an Ordained Elder in The United Methodist Church and is a native of San Antonio. Before coming to First Church, Pastor Michael served churches in Woodsboro, Floresville, San Antonio, and Cuero. He has a B.A. in Chemistry and Philosophy from Trinity University in San Antonio and a M.Div. from Candler School of Theology at Emory University in Atlanta, GA. 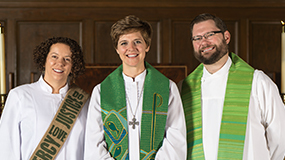 Originally planning to study medicine, Pastor Michael discerned a call to ordained ministry in the summer before his senior year of college while participating in a United Methodist campus ministry at Texas A&M during summer school. Taking part in worship and Bible study, he heard again the voice of a God of grace, the one he had known as a youth from his home church. God’s grace continues to guide Pastor Michael in ministry. The power of God’s unconditional love and the healing of God’s making all things new through the risen Christ are regular themes in his preaching. During his pastoral ministry, Pastor Michael has discovered a love of creative worship, an appreciation for ecumenical ministries, and a heart for service. When he’s not serving a congregation, you might find Pastor Michael cutting a rug two-stepping and swing dancing at Texas’ finest dance halls, tubing in a cool river, or exploring the wonders of Austin.